Lexus of Richmond is proud to present Lexi Long of Deep Run High School as the week 30 nominee for the Leadership Award Scholarship. An AP Scholar with Distinction she is the expected valedictorian with an overall 4.7 GPA. She scored a 1510 out of 1600 on the SATs, a 780 out of 800 on the SAT Math 2, and a 35 out of 36 on the ACTs. Lexi is a member of the National Honor Society where she is currently serving as the President. She is a member of the Math Honor Society, Science National Honor Society, and the Computer Science National Honor Society. A two time Principal’s Award recipient, Lexi has received a Wildcat Scholar Award for both Foreign Language and Science. She has received a NOCTI Web Design Certification and a Certificate of Distinction Award for Aspirations in Computing from the National Center for Woman and IT. While attending Deep Run, Lexi has been a 4 year Varsity Soccer player. She plays midfield and forward, and as a senior she was a captain of the team. In 2016 she received the Most Improved Award and was the team’s leading goal scorer. She has been named to the 1st Team All Conference, 1st Team All Region, and the 2nd Team All State. Lexi has been a two year member of the Varsity Gymnastics team and was a captain for her senior season. In 2017 she received the Spirit Award, and in 2018 she was selected for the coaches award. She also took on one year of Varsity Swimming at Deep Run. Outside of her school athletic career, Lexi has participated in 14 years of club soccer with the Richmond United ENCL Club and 14 years of The Dominion Club Summer Swimming. As a part of Deep Run’s Center for Information Technology, Lexi has been Class Representative for the Speciality Center. She has been a part of the Girls of the Center for Information Technology club, and has served as their Vice President and the Historian. She was selected to represent Deep Run as a freshman and sophomore for the Henrico County Student Congress. As a part of this group, students from each high school in the county hold meetings to discuss ideas on bringing the community together. She has served on her school’s Student Council Association and was the Class Historian. Lexi has been a member of the Beta Club, Key Club and Programming Club. In 2016 she attended the Hugh O’Brian Youth Leadership Conference, and in 2017 Lexi was selected for the American Legion Auxiliary Virginia Girls State. Involved in numerous organizations, Lexi is no stranger to giving back to her community. Through her school she is a math and science tutor for her peers. She has also volunteered and run several events a the Center for Information Technology. Lexi has been middle school mentor through a program called SODA. She is a 7 year volunteer for the Wyndham Swim and Racquet Club. Lexi has spent time with Caritas, and she has participated in a mission trip to Raleigh, NC. In 2015 Lexi was even recognized as the ENCL S’hero Community Leader of the Month. Lexi has won a dinner for two and is now in the running for the $10,000 scholarship. 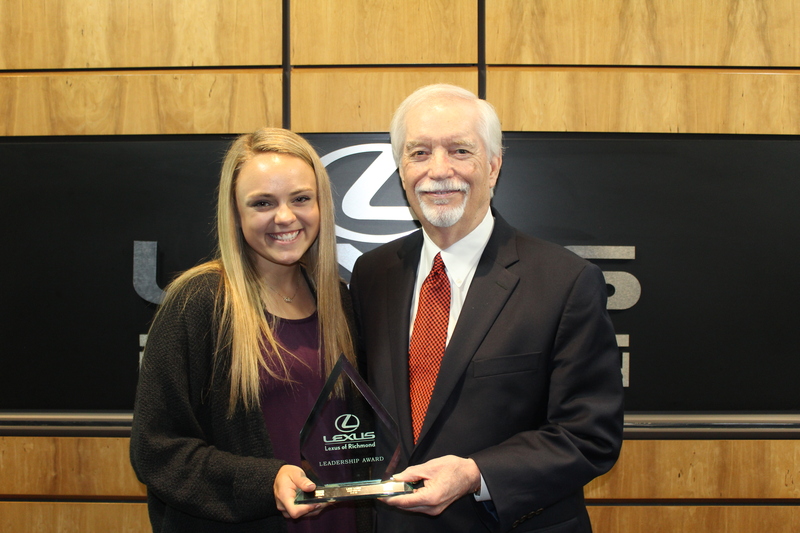 Watch the Fox Richmond – WRLH interview and the Lexus of Richmond Leadership Award interview to learn more about Lexi! Remember to check Facebook for more information about each weekly nominee throughout the school year! Previous PostLexus of Richmond Leadership Award Week 29 – Kyle ThielschNext PostJune Service Specials!